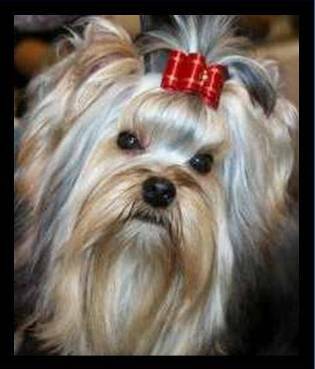 Does your Yorkie have a silky or cottony coat? Why do Yorkie puppies have so much black on them? 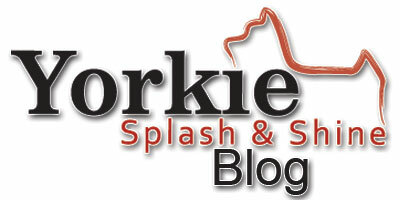 Learn about Yorkie Coats and Coloring in our article below. The coloring of a Yorkie is very interesting. Yorkies are born black with tan "points." These areas of tan are on the muzzle, on the legs, the ears, and the underside of the tail. As a Yorkshire terrier transitions from a puppy to an adult, the coat changes color, and the tan increases and gets richer with age. Many Yorkies are born with white spots, generally appearing on the chest, with occasional white markings on the feet and sometimes below the mouth. White markings on the feet can occasionally make the toe nails white or clear as well. These markings will fade quickly and will not persist into adulthood. Many breeders say that a white mark on the chest is an indication that the puppy will be a good coat grower – though not indicative of the quality of hair, the puppy will likely be able to grow a long full coat in adulthood. As an adult, there are 4 categories of accepted colors for Yorkies. These are the only coloring choices available on the AKC application form for a Yorkie. These colorings are: black and tan, black and gold, blue and gold, and blue and tan. Since Yorkies don't attain their true coloring until the age of about 2 years old (3 in some cases), choosing a coloring for AKC registration purposes is merely a best guess for the new owner. Breeders who know their lines can usually accurately predict the adult coloring of a puppy. Whenever possible, the breeder should complete the coloring section for the new owner. There is a lot that can be said about a Yorkie's coat. The official standard for Yorkshire terriers is that of a glossy, fine, and silky coat that is perfectly straight and is long on the face and moderately long on the body. The Yorkshire Terrier Club of America (YTCA) dictates the official standard to the American Kennel Club (AKC). The approved breed standard is the definition of perfection in a Yorkie. This standard is what all responsible breeders strive to produce. In essence, any Yorkie that deviates very much from this standard should not be considered breeding quality. But, every Yorkie is not perfect. Because of the dogs bred to create the Yorkie, there are some throwbacks that bring out these genes in the offspring of some seemingly "perfect" Yorkies. All three of the breeds responsible for the creation of the Yorkshire terrier are now extinct, so good information on the origins of the Yorkie is largely unknown. I will refer to these groups as "Cottony Coats" and "Red Legged Yorkies." These coat "types" as well as the standard silky coat make up what I consider to be the three general coat types of Yorkies. There are various mixtures of these types, creating some rather interesting coats. Yorkies with cottony coats generally have a large quantity of hair from a very young age. As they grow, the hair continues to grow in length and bulk. From my experience, a cotton coated Yorkie looks about twice as big as he actually is (get a cotton coated Yorkie wet and you will be shocked at how small he looks). Though cotton coated Yorkies can have the correct coat color and length, they will never attain the fine human-like appearance of the proper silky coated Yorkie. Red Legged Yorkies are those Yorkies with "wiry" hair that never grows very long. Though, I have seen different degrees of length in these types of coats. Some can grow a coat of about 6 inches, others 2 inches and then everywhere in between. Usually, the hair on the face of a red legged Yorkie grows longer than the hair on his body. The red legs tend to be very dark in color, with deep, rich tans that can appear almost reddish in natural light. Their black is a true black that rarely turns bluish. I have heard that old-time breeders used red legged Yorkies to add color and proper coat texture back in to their lines.